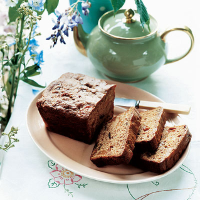 This tea loaf is full of semi-dried fruit and is virtually fat free - better still, it is so lovely and moist you don't need any butter or cream to go with it. It is best eaten on the day it is made. Pour 300ml boiling water into a measuring jug with the tea bag and leave to infuse for 4-5 minutes. Using a pair of scissors, cut the mixed fruit medley into small, sultana-sized pieces and place in a large bowl. Pour the hot tea over, then discard the tea bag. Stir well, cover with clingfilm and leave to soak for 4-5 hours or overnight. Preheat the oven to 180°C, gas mark 4. Butter and line the base of a 900g loaf tin. Stir the sugar and then the eggs into the fruit mixture. Sift in the flour, baking powder and cinnamon and stir the mixture until thoroughly combined. Pour the mixture into the prepared tin and bake for 1½ hours, or until a skewer inserted into the middle comes out clean. Cover the top with foil if the loaf starts browning too much. To freeze, wrap well in baking parchment or in a large freezer bag before freezing. Thaw for about 4 hours at room temperature then slice and serve.